That's not exactly how the traditional poem goes, but it's how an early Christmas for more than 300 children and families played out shortly before the holiday. 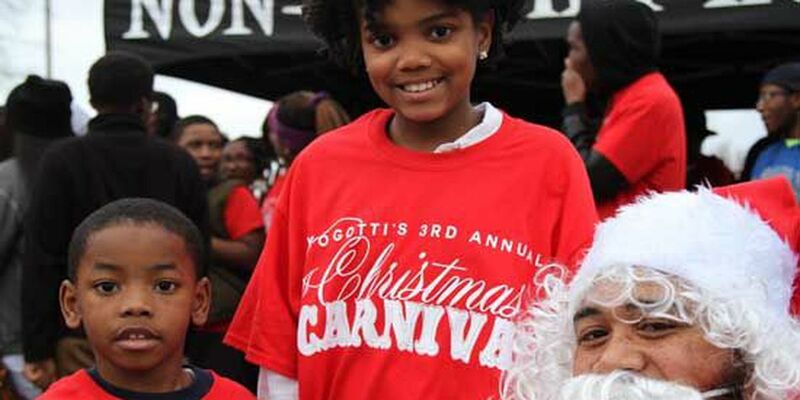 In the parking lot of his Hickory Hill restaurant, Prive', Memphis rapper Yo Gotti and former NBA star Anfernee "Penny" Hardaway hosted the Third Annual Yo Gotti Christmas Carnival on December 22. The fun-filled event benefited children from the Boys and Girls Clubs of Greater Memphis, as well as winners from a Hot 107.1 Christmas wish list giveaway. In previous years, Gotti went door to door distributing gifts to families throughout the area. But in 2014, he and Hardaway decided to collaborate and expand the event. "Actually, my first goal was to reach out to the community and the kids of Memphis. When we came up with that, we went back and forth with how to grab the kids we wanted to reach, and that's how we came up with the Boys and Girls Club," said Gotti. "Some of us attended those same programs when we were younger and we wanted to give back to that same cause." Although the event was closed to the public, an additional 100-150 children and families from the community lined up outside of sectioned off area of the parking lot, hours before the carnival was scheduled to begin. Instead of denying the surplus of fans, Gotti invited everyone inside the carnival grounds. Additionally, his team made an extra trip to the toy store to ensure that everyone who came left with something. "To me it's bigger than the toys," said Gotti. "It's the spirit that you should get from the family." The parking lot was transformed into a Christmas wonderland complete with reindeer and games, something the kids looked forward to. "I'm with the Boys and Girls Club and this was a field trip," said Keleisha Cathy. "I'm most excited about the games and the rides. The Boys and Girls Club of Greater Memphis primarily focuses on educational advancement. Through mentoring, tutoring and various training programs, in 2014 BGC graduated 100 percent of their seniors. According to their website, 40 of those students are attending college on a scholarship and 12 are entering the armed forces. The 300 BGC students in attendance were between the ages of 6 and 18 years old, and represented clubs across the city, particularly North and South Memphis. "The perception is that positive behavior is not rewarded and is just something that you're supposed to do, and more negative behavior can get rewarded by i.e. gangs, selling drugs, stealing ... you get immediate gratification from that," said Charles Griffin, Vice President of Operations. "What we want to be able to reassure these young people who are doing well in the community that it's a reason why we want you to do well. We want you to be productive, responsible citizens and this is just a token of that gratitude." In addition to toys, games and rides, children were also given clothing from Gotti's music label CMG (Collective Music Group), treated to free haircuts from his personal barber, and danced the night away to a DJ playing the latest music. As the carnival wrapped up, the Frasyer native turned world-renowned music artist noted that anyone can have a positive impact on kids in the community. Gotti added, "It's about unity. You can always move stronger when you join forces."